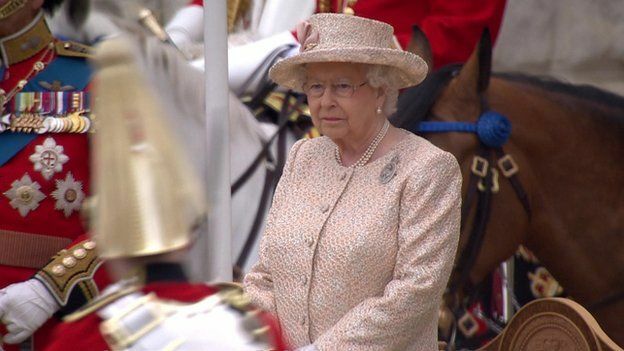 The Queen gets two birthday’s each year, her actual birthday which is on April 21st, and her “official” birthday which was officially celebrated today with the Trooping The Colour ceremony on Horse Guards Parade. 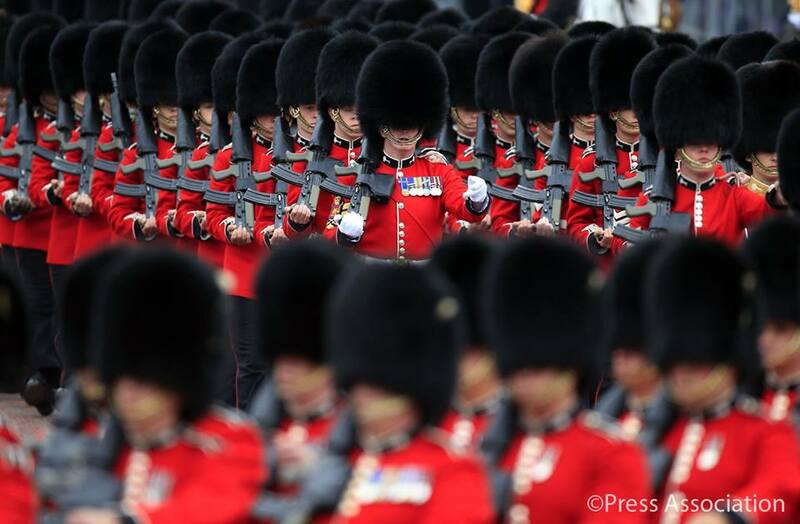 Trooping the Colour 2015 on The Queen’s “official” birthday. Although The Queen was born in April, it has long been the tradition to celebrate the Sovereign’s birthday publicly on a day in the summer, when good weather is more likely. 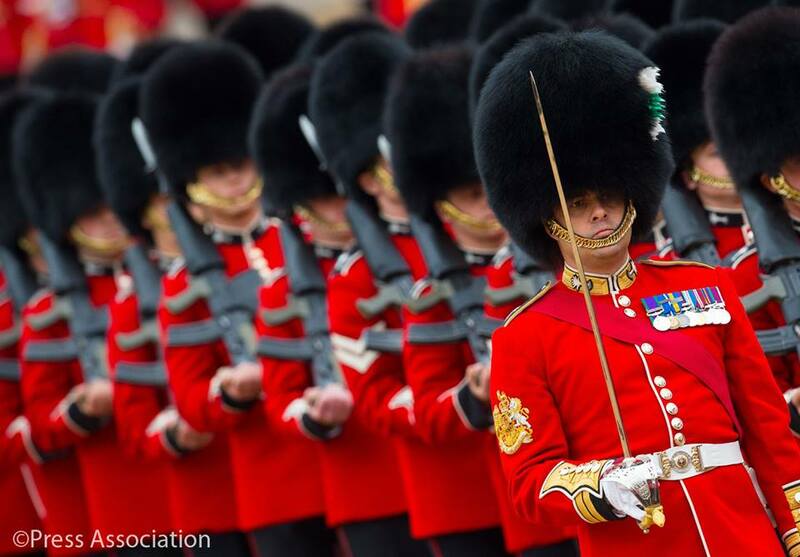 Trooping the Colour is carried out by the Household Division (Foot Guards and Household Cavalry) of which Her Majesty is Colonel-in-Chief, and this year, as they mark their centenary, The Queen’s Colour of the 1st Battalion Welsh Guards was carried down the ranks, or ‘Trooped’. The Queen and The Duke of Edinburgh, were accompanied by Royal Colonels The Prince of Wales, The Duke of Cambridge and The Princess Royal on horseback, and other members of the Royal Family watched the ceremony on Horse Guard Parade. 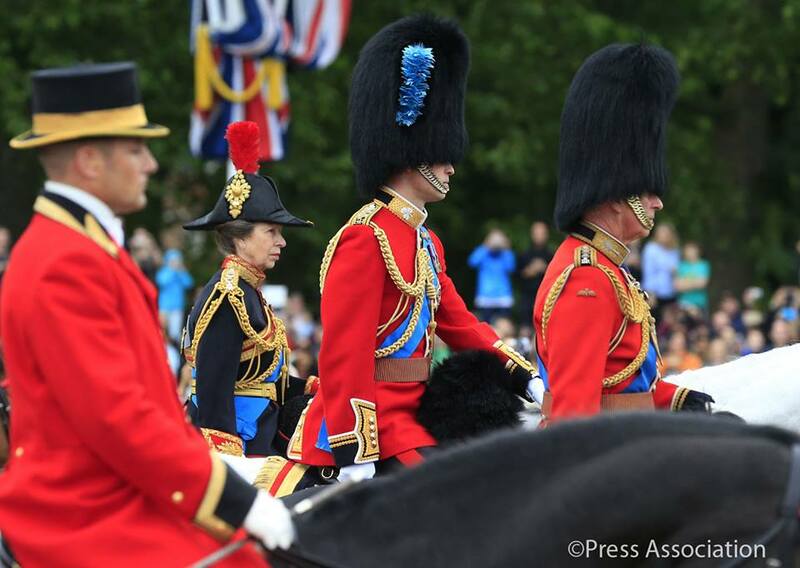 The Prince of Wales, The Duke of Cambridge and The Princess Royal follow on horseback, dressed in full regalia. 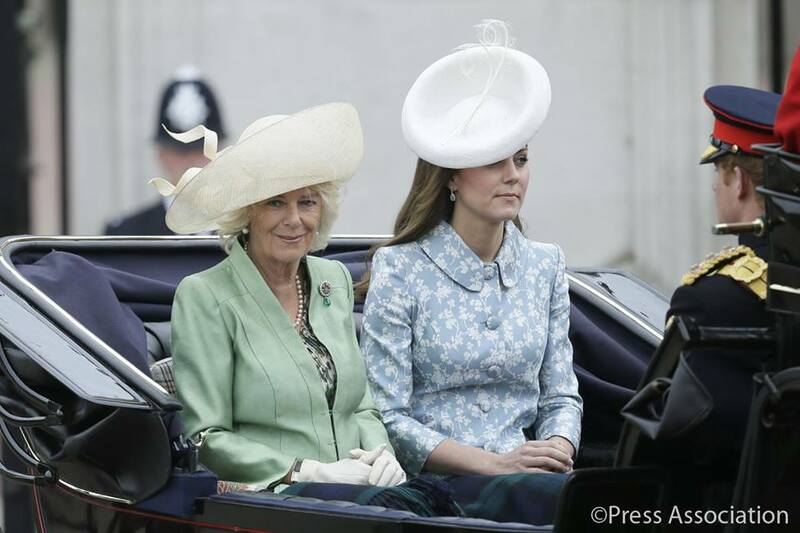 The Duchess of Cambridge, accompanied by The Duchess of Cornwall, makes her first public appearance since giving birth to Princess Charlotte who was not at the ceremony. This military ceremony dates back to the early eighteenth century or earlier, when the colours (flags) of the battalion were carried (or ‘trooped’) down the ranks so that they could be seen and recognized by the soldiers. 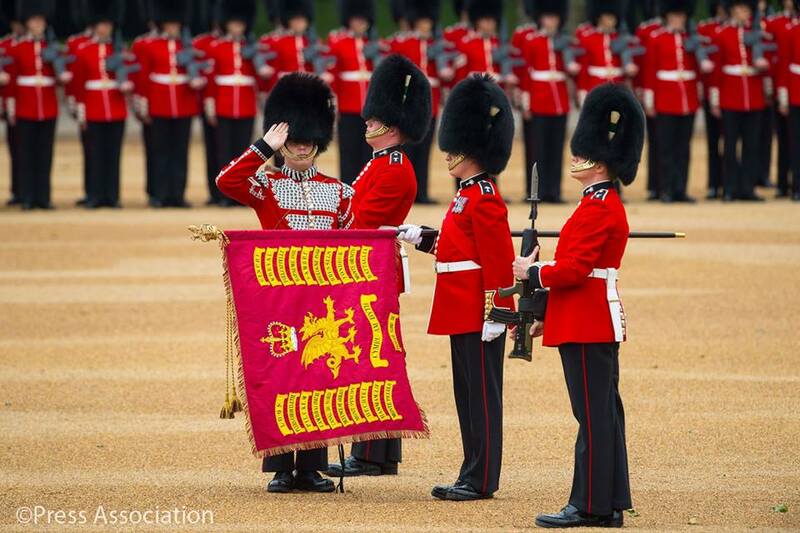 Since 1748, this parade has also marked the Sovereign’s official birthday. 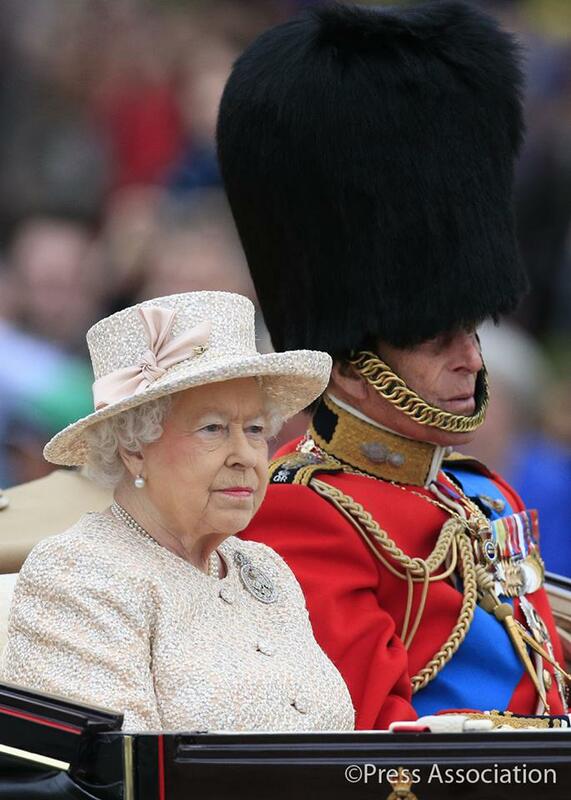 From the reign of Edward VII onward, the Sovereign has taken the salute in person at Trooping the Colour. The Queen inspects the troops. After the massed bands have performed a musical ‘troop’, the escorted Regimental Colour is carried down the ranks. The Foot Guards and the Household Cavalry then march past Her Majesty, and The King’s Troop, Royal Horse Artillery, rank past. 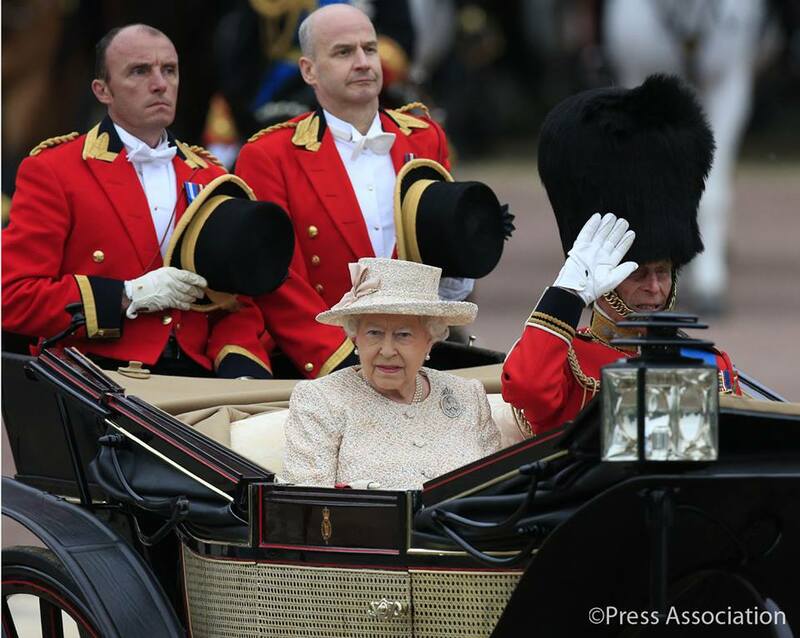 The Queen rides in a carriage back to Buckingham Palace at the head of her Guards, before taking the salute at the Palace from a dais. The troops then return to barracks. 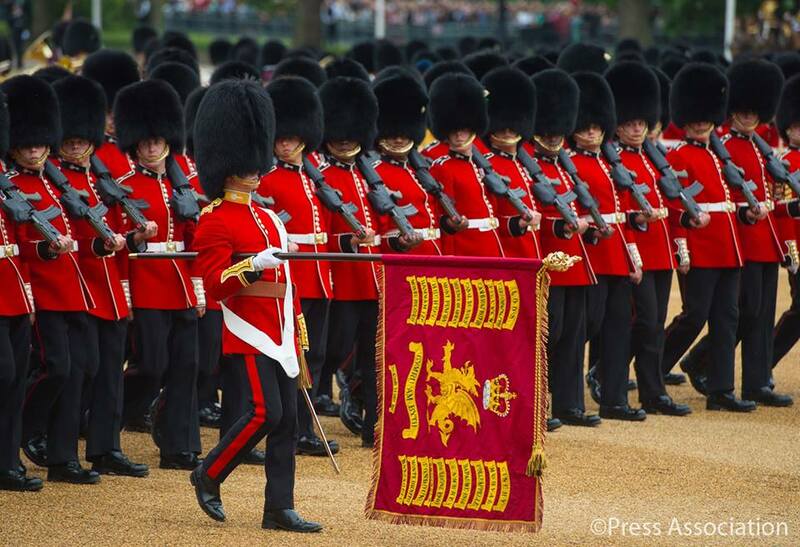 Here is a look back at 60 years of Trooping the Colour including Her Majesty’s first ceremony as monarch! After the ceremony The Queen and members of the Royal Family gathered on the balcony of Buckingham Palace‪ to watch a flypast from the Royal Air Force Aerobatic Team, The Red Arrows, after the Trooping ceremony. 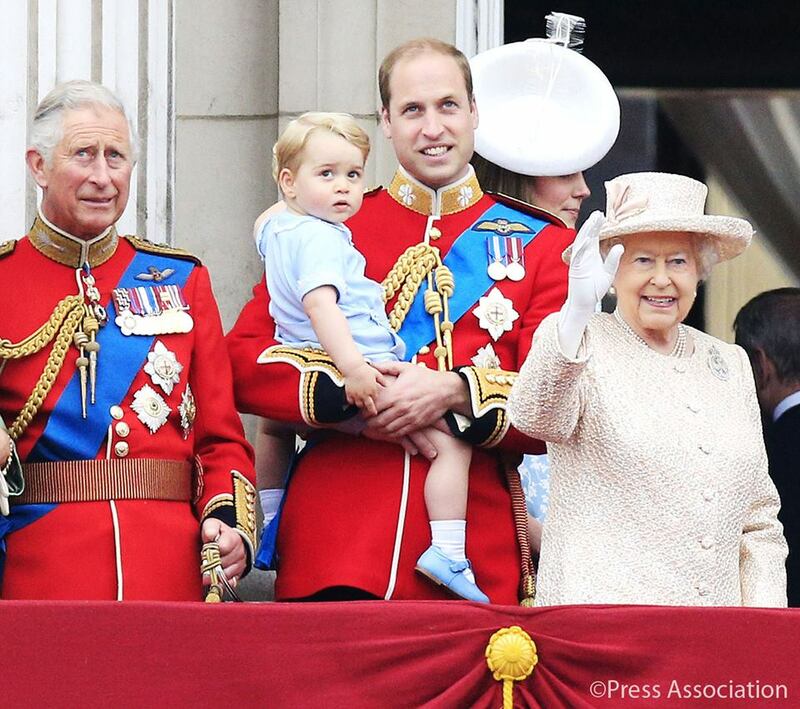 This year’s Trooping the Colour marked Prince George‘s first appearance on the balcony of Buckingham Palace, wearing the same outfit his father, The Duke of Cambridge, wore on the balcony after The Queen’s Birthday Parade in 1984! His sister, Princess Charlotte did not attend the ceremony. Prince George’s first balcony appearance! The Queen has attended Trooping the Colour every year of her reign, except in 1955 when a national rail strike cancelled the event. This entry was posted in Rule Britannia! and tagged British Monarchy, Catherine The Duchess of Cambridge, Kate Middleton, Prince George, The Queen, Trooping the Colour. Bookmark the permalink.